Merry Christmas! God the Son has indeed come into this world just as the Scriptures proclaim! In celebration of our 40th wedding anniversary, my wife and I joined a Shepherds Seminary student study trip on the geography and Biblical site exploration of Israel. We just returned from this two week intensive course. With Bibles open and guided by Dr. Doug Bookman, New Testament Professor, and Dr. Joel Cramer, Archeologist, we witnessed with awe the very historical stage where Jesus, God the Son, our Creator and Redeemer, spent 33+ years on this earth. In this season, where so much of the focus is made up magic and miracles, do not miss the fact that there is a real Christmas that occurred in history and it happened as the text proclaims. Because of Christmas there is hope! Jesus's identity as God the Son, the Messiah, was proven by the fulfillment of all the prophecies about Him. Unbelievably these total over 360. Fulfillment of even part of these would be a statistical mathematical impossibility. How crazy to believe that anyone could fulfill all these prophecies, unless of course it happened and Jesus was the promised Messiah! This Jesus born in Bethlehem and raised in Nazareth was all God yet a normal human being like us. He lived without sin fulfilling the Holy Law of God. Then was rejected by His own resulting in a politically charged Sanhedrin forcing the hand of Roman leaders to crucify this Jesus. The scriptures prophesied and proclaimed this for, “Jesus took our place on that cross and our sin was placed upon his body on the tree," I Peter 2:22-25. He was the Lamb of God that took away the sin of the world, I John 2:2, John 1:29. The proof was the declaration on the cross, “the debt is paid in full," the literal meaning of the Greek word, Tetelestai. His resurrection on the third day affirmed it! Only the true Savior can provide guidance in this life and eternal life after physical death and this gift can be received by faith trusting the Word of God! Blink your eyes and pinch yourself for this did happen in history and on the geographical stage of Israel! Here are three reasons why, no matter who you are or what circumstance in life you are in, Christmas can indeed be celebrated. The Savior, your True Shepherd, came into this world with you in mind - He cares! He has overcome the greatest enemy of death and offers eternal life. He will meet every need for He has met your greatest need. Trust Him today! God's Word is the greatest authority. It can be trusted and is sufficient for life and godliness. Rejoice in a trusted authority! Our ministry exists to proclaim this good news! Excitedly, I want to share that this Christmas hope, proclaimed at a recent legislative conference in late November, in D.C., resulted in one political activist putting his trust in the Lord! Your partnership allowed our team to be there! Thank you! Glory to the Lord! Yes, be merry indeed, for it is a time to celebrate and commemorate Christ! God laid this Christmas poem on my heart, The Gift You Could Never Afford. Merry Christmas! 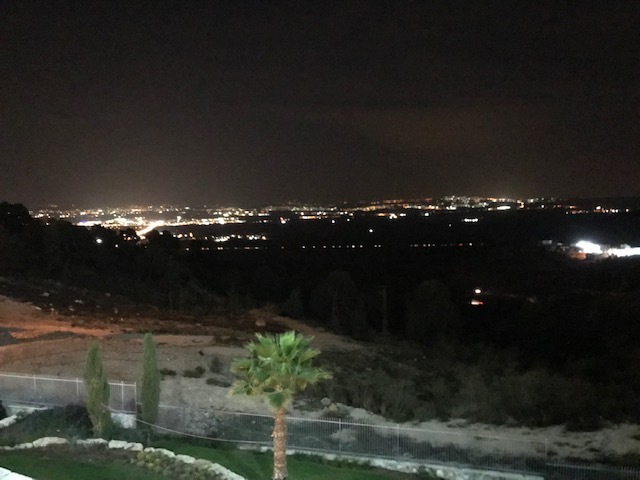 Nazareth, looking South overlooking Jezreel Valley.